How important are baby teeth? This post will not only explain the importance of baby teeth, but it also includes tips to make it easier to take care of them! It has been a long day, you’re exhausted and the last thing you want to do is brush your kids’ teeth. It would be so much easier just to send them to bed. Trust me, I’ve had these feelings many, many times. I’m here to tell you that it is not worth it! Some days yes, it is worth it (HA HA), but consistently missing brushing your child’s teeth can be very damaging. They help your child chew, speak, and smile. They also help permanent teeth grow in the correct position. Children can get cavities as soon as their baby teeth appear. Cavities can hurt and can cause children to have problems eating, speaking, learning, playing, and sleeping. I have 4 tips to make it easier on you to help you really take care of your baby’s/child’s teeth. Talking with other moms I have seen that teeth brushing is a priority to them but is one of the first things that is skipped if they are having a busy day. Here are a few things that have really helped us with our 5 boys. This was a game changer for us. Kids are drawn to electronics, so naturally with an electric toothbrush, they are thinking they are pretty awesome. The best part is that you can time the toothbrush for 2 minutes. When the toothbrush turns off, they are done. With my younger children, I sometimes brush their teeth for the entire 2 minutes. Most of the time I have them start at the same time and I rotate helping them. For the first 30 seconds I brush one kid’s teeth, making sure I get every tooth. I hand them the toothbrush and let them go at it while I take over another child. This shortens the process, especially if you have 5 kids. My older boys brush their teeth every night by themselves and do a good job. We consistently ask to see their teeth and always check them out. Flossing is so important to help prevent cavities. Many cavities occur in between teeth which is why it is good to get your kids in the habit of flossing. You should start flossing and cleaning in between teeth as soon as your baby has two teeth touching. Check out this free printable for more details on how to prevent cavities. You can get yours here. 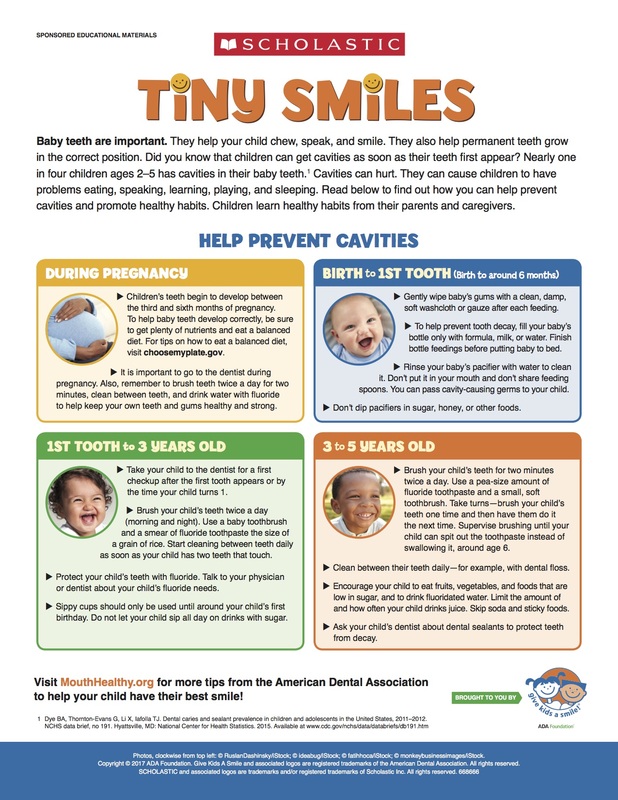 I have recently teamed up with the American Dental Association Foundation to help spread awareness of different resources that will help educate parents and caregivers the importance of taking care of your baby’s teeth. This program is called Tiny Smiles and is part of the ADA Foundation’s Give Kids A Smile® program. Below are links to 3 fantastic free printables for your family, patients, or whoever. They are full of information that will guide parents through the years of caring for your kids’ teeth. There is also a ton of other great information on their main website scholastic.com/givekidsasmile. There are activity sheets for kids like this one. Learn what is good for your teeth and what to expect to happen at the dentist. They are cute, fun, and free and you can print them off for your kids! It is daunting being a new mom! 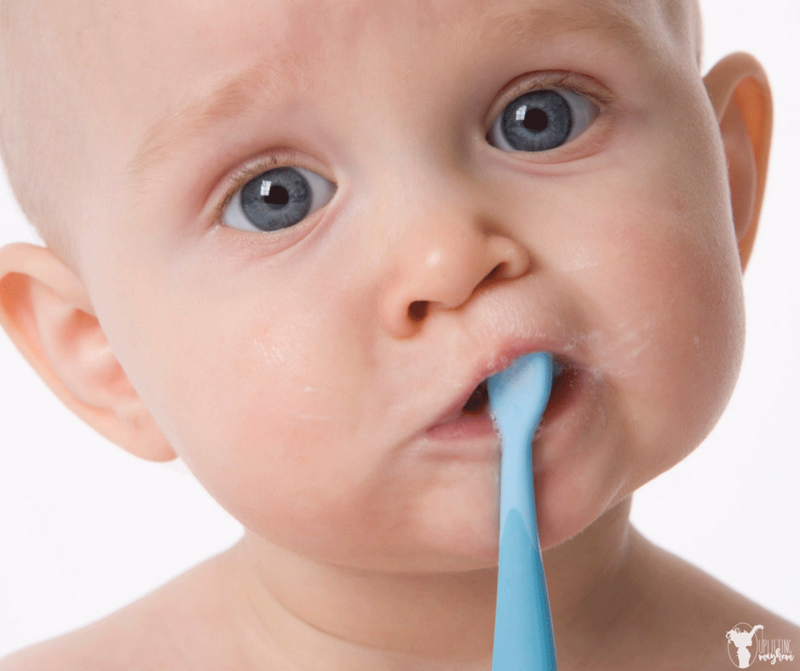 Check out these above links and educate yourself on how important your baby’s teeth are. For a quick glance at some of the great info, here are a couple of visuals with information that will guide you by your child’s age. Baby teeth are important. My boys don’t lose their teeth early like a lot of their friends and they are continuously asking me when they are going to lose a tooth! I just keep telling them it is good to have their baby teeth for as long as possible, because they will have their adult teeth much, much longer! Hope this helps you make cleaning teeth time easier for you. 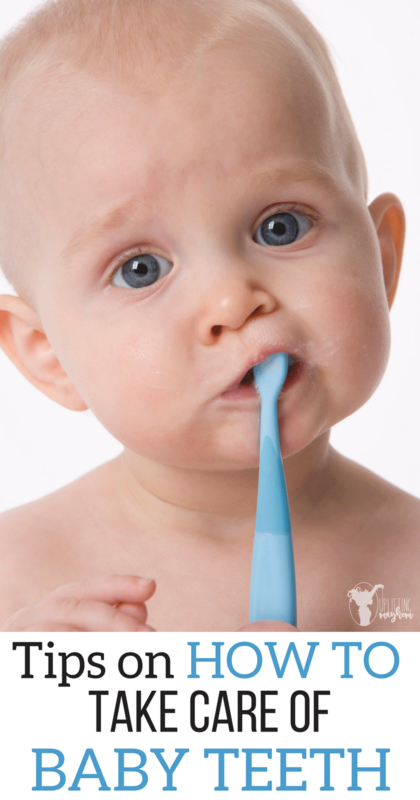 For a cute teeth-brushing chart for you kids, check this post out.